The relaxing aromatheraphy massage at Eurotel’s fantastic Spa de Soleil. It was an hour of rhythmic massage that combines the techniques of Swedish, Shiatsu, and Thai. Spa and body massage has become synonymous with peace and serenity, which many believed to be a luxury in this stress-driven world. Body massages and a few hour of relaxation and of emptying the mind is a must to keep me sane. This is a great way to end end the busy and roaming-around-days we had in Baguio. I am glad that I had the chance enjoying some relaxation and even more, that I’m able to push myself to be comfortable in yet another new experience to relax. 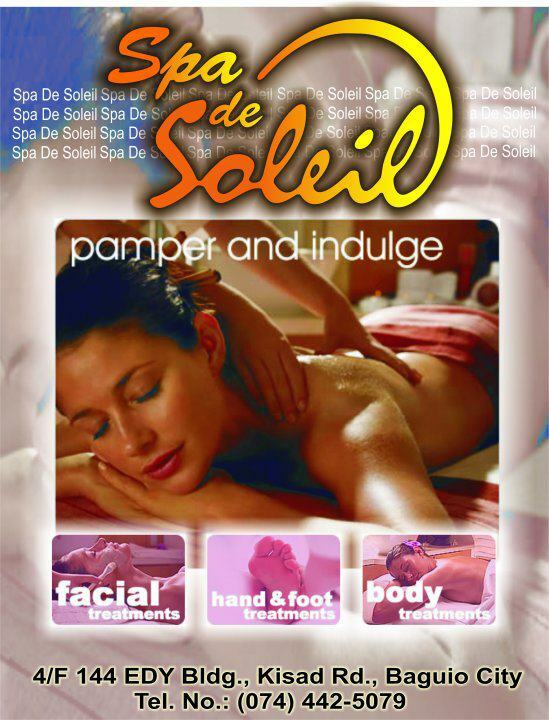 Modesty aside, the Spa de Soleil experience certainly made me excited for my next body massage trip. This nostalgic experience at Spa de Soleil really gives me a relaxing time without hurting my wallet because it's a treat! That's the best thing happened after the two days of walking around in Baguio. It reordered and cleared my thoughts thus bringing back my sanity. We had a really deep and comfortable sleep that night. All the fatigue brought about the long trip and our outdoors adventures in Baguio City disappeared as we woke up all refreshed the next day.